The BC Biomedical FingerSim™ System provides a rapid, inexpensive and convenient means of assessing the function of the entire pulse oximeter system, including the oximeter sensor. A set of three FingerSims™ are included in each kit. Each of the three FingerSims™ contain a fluid with precisely controlled light absorption characteristics which are sandwiched between two glass slides. The concentration of the substances in the three mixtures allow the FingerSim™ to mimic the light absorbing qualities of arterial blood as measured by an oximeter at different oxygen saturation values (nominally 97%, 90% and 80%). The FingerSims™ are easily identified by the color coded end caps (Red - 97%, Blue - 90% and Black - 80%). Squeezing the colored coded flat end will produce a pulsatile movement of the solution. This pulsation is detected as a pulse by the oximeter system being tested, thus allowing the oximeter to calculate and display an SpO2 value. The value corresponds to the fixed light absorbing characteristics of the particular FingerSim™ being used. The BC Biomedical FingerSim™ can be used with any finger probe SpO2 monitor. Formerly made by Nonin Medical - known as the Finger Phantom. 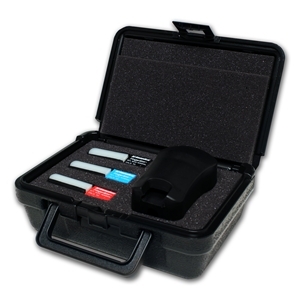 The FingerSim™ Starter set is cost effective and easy to use. Easily add calibrated pulse rates with the optional BC Biomedical SPO-2000 Pulse Oximtery Simulator or add pulse oximetry testing capabilities to the BC Biomedical NIBP, PS-2200 & PS-2100 with the purchase of the BC Biomedical MSP-2100 Pulse Oximetry Module. PLEASE NOTE: FingerSims™ are guaranteed for a shelf life of 12 months, these units are NOT able to be recalibrated. Please order a FingerSim™ Replacement Set at the end of the one year replacement cycle.